Learning never occurs in isolation. Knowledge and memories influence how we perceive new experiences, and the information that we perceive indelibly changes what we know and remember. The Mack Lab explores the dynamic interaction of attention and memory with a unique combination of computational modeling of human behavior and cutting edge cognitive neuroscience techniques, including functional neuroimaging and neurostimulation. See below for a sample of our recently published and ongoing projects. Concepts organize the relationship among individual stimuli or events by highlighting shared features. Often, new goals require updating conceptual knowledge to reflect relationships based on different goal-relevant features. Yet, how these concepts are formed and updated in the brain when goals change remain an open question. In this work, our aim is to characterize how the hippocampus organizes and updates object representations to reflect changing conceptual knowledge. By combining computational modeling of classification learning with representational similarity analysis of fMRI data, we have demonstrated that neural representations in the hippocampus reflect concept organization. Additionally, during early learning, when concept updating is most consequential, we see that the hippocampus is functionally coupled with prefrontal cortex. This work suggests that when task goals change, the hippocampus organizes object representations in new ways, resulting in updated concepts that highlight the features most critical to a new goal. Formal computational models make testable predictions about the unobservable algorithms and representations that underlie cognition. Similarly, functional neuroimaging reaches beyond behavior to characterize cognition at the level of neural mechanisms. Yet, a critical barrier in cognitive neuroscience is a lack of robust methods for linking models and brain. A central aim of our research is developing new approaches that combine computational modeling with advanced fMRI measures. One example of this aim is the development of a novel technique to select among competing models of category learning using neural pattern information analyses. The key idea underlying this approach is that if a formal cognitive model represents the true nature of learned knowledge, continuous measures of that model’s state during learning should be reflected in trial-by-trial brain states. Comparing the degree of consistency between brain and model states across a set of competing models enables one to pinpoint which theory is most consistent with both behavioral and neural responses. In applying this novel method, I discovered that multivariate brain activation patterns during category decisions consistently decoded signatures of concrete memory traces from previous experiences as predicted by exemplar theory, rather than the abstraction of those experiences as predicted by prototype theory. This research highlights the two-way street that is model-based fMRI; computational models can be leveraged to reveal the neural correlates of cognitive mechanisms, but neural measures can also adjudicate between competing cognitive models. Most decision making research has focused on perceptual decisions that depend on information currently or recently available to the sensory system. However, decisions in our everyday life often rely on information that we recall from past experience. A common thread across memory theories is that when making a decision, relevant memories are reinstated in the hippocampus to influence how we act. Despite this theoretical prominence, the neural computations that support how we use memories to guide decision making remain poorly understood. Recently, I combined fMRI pattern analyses with computational modeling to evaluate how internally generated mnemonic content influences decisions. After learning associative pairs (e.g. bananas and Taj Mahal), participants performed a delayed match to memory test in which they were shown a retrieval cue and then after a delay, a probe that either was (match) or was not (mismatch) paired with the cue during the preceding learning phase. 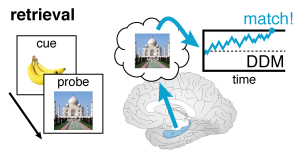 Using neural pattern information analyses, I showed that neural activation in the hippocampus and perirhinal cortex reflected retrieval of items from memory (e.g., Taj Mahal when cued with bananas). Further, using functional connectivity methods, I found that the hippocampus was selectively coupled with face- and scene-selective visual regions during face and scene retrieval, respectively. I also linked hippocampal reinstatement signatures to behavioral outcomes using a computational drift diffusion model (DDM) of decision making. I found that the fidelity of item reinstatement predicted how quickly evidence accumulated in service of a decision; in other words, more neural evidence for hippocampal retrieval of Taj Mahal was related to faster accumulation of evidence toward an ultimate "match" decision. These findings provide a novel fMRI demonstration that the hippocampus reinstates detailed memories. Additionally, by combining the DDM with a neural measure of memory reinstatement, I have shown not only that what we remember influences how we act, but also provide a testable mechanistic account of how memory guides decision making. How quickly we can make categorization decisions at different levels of abstraction has long been recognized as a window into the organization of conceptual knowledge. Seminal research demonstrated a behavioral advantage for classifying at the basic level; for example, categorizing a bird is faster than an Indigo Bunting. More recently, however, conflicting results have shown speeded categorization at a superordinate level of abstraction – we are fastest at identifying animals. To reconcile these findings, I used behavioral experimentation and computational modeling to investigate the time course of perceptual encoding (Mack et al., 2008; 2009; Mack & Palmeri, 2010b) and the organization of category knowledge (Mack et al., 2007; Mack & Palmeri, 2010a; Shen, Mack, & Palmeri, 2014) to show that although category knowledge is organized around basic-level categories (e.g., bird), coarsely encoded perceptual information may preferentially access higher levels of the knowledge hierarchy (e.g., animal). I proposed a novel framework (Mack & Palmeri, 2011; 2015) in which visual information is encoded into a perceptual representation that is used to query category knowledge. Coarse visual features encoded early access more abstract categories; but with more fine-grained visual information encoded over time, the dominantly represented basic-level categories are relatively more accessible. By grounding the temporal dynamics of categorization in a computational modeling framework, I showed that the disparate findings about the speed of categorization decisions are reconcilable under a new theoretical framework. My work also provided a testable mechanistic account of how visual perception interfaces with conceptual knowledge.